Manchester United have signed Japanese midfielder Shinji Kagawa in a deal expected to be worth $25 million. It’s the first major signing that Manchester United have made this summer, and it’s also one of the biggest stories in the history of Japanese, or indeed Asian football. Shinji Kagawa has agreed to join the English Premier League club. United have agreed a transfer fee with Borussia Dortmund, who signed the 23 year-old in the summer of 2010. While the Bundesliga team is reluctant to see him leave, it may at least feel some consolation at being compensated far more than the German outfit paid J-League team Cerezo Osaka for the midfielder. The deal with Manchester United is expected to be worth around $25 million. As well as a very healthy profit, Dortmund got two very good seasons from the player as he helped to deliver successive league championships.But while Dortmund is a big club, United is a giant, claiming last week that it has 659 million fans around the world. There are many reasons why Kagawa is attractive to United. For a start, he has already proven to be a success in one of Europe’s biggest leagues. Signing any player is a gamble, but signing one who has already starred in Germany reduces the odds of failure considerably. 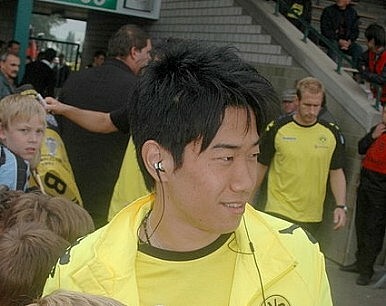 The fact that Kagawa started impressing for Dortmund as soon as he arrived clearly hasn’t gone unnoticed. There’s also his age. At 23 he’s already looking extremely good, but has plenty of time to get even better – there should be years left in this player. He’s versatile, and can play on either wing, as an attacking midfielder or just behind the striker. He provides goals – 24 in two seasons in Germany, despite missing much of the second half of the first season because of a foot injury. And he doesn’t just score goals, he creates them. But there’s something else, too. When a European club buys an Asian player, there’s always talk that one reason is commercial, and the theory goes that a player like Kagawa can help sell shirts and attract sponsors in his homeland. This isn’t completely untrue. Successful Asian players who play for major European clubs can contribute commercially. But this will only happen if they are seen to contribute on the pitch, something Kagawa looks set to manage.